Please don't hate me, but I haven't gone back to school yet. :) We had a longer break to begin with, but extremely cold temps have caused school to be cancelled the last two days. It was great to relax today and really tackle all my teacher to dos that I didn't quite get to over break. I even got to make a delicious healthy and dinner tonight. We had Low-Carb Spaghetti Squash and Meatballs from Iowa Girl Eats and it was amazing. :)I even got to work on a freebie for y'all. 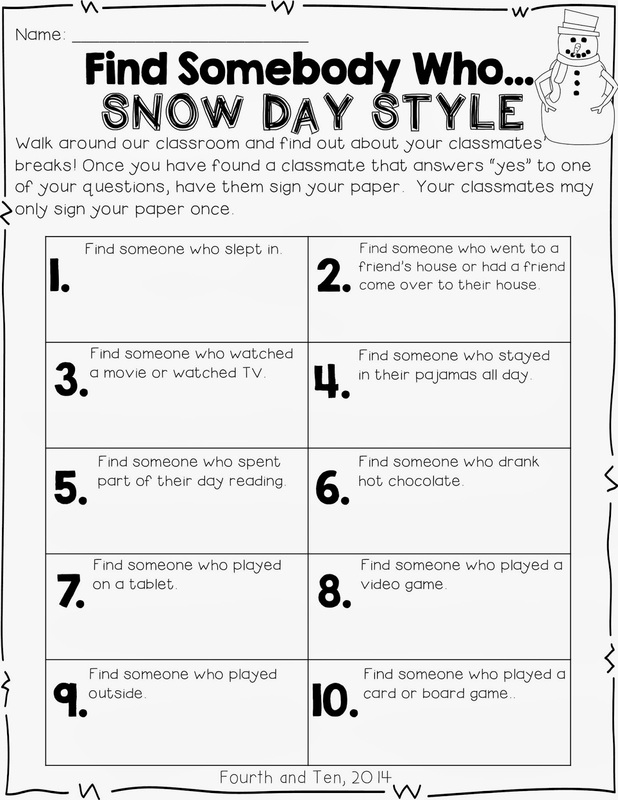 I love to do Find Somebody Who activities in my classroom, especially when we go back to school from a long break. They are perfect for getting my kiddos moving and interacting. :) Last year we did my Winter Break Find Somebody Who, which you can find in here. Super cute! I do this at the beginning of the year (like a classroom bingo.) No Snow Day here in HI, but we don't go back until Wednesday! We went back last Thursday, but we were off Friday, Monday and Tuesday due to weather. Thank you for the Freebie. That will be a fun activity for when we go back. This is my second day back! Love the freebie! Your freebie is SO cute, Lisa! It will be perfect for the day we go back... whenever that might be, haha! I just got the call that we are canceled again for tomorrow! Nothing like a Christmas Break extension! :) Stay warm! Batman vs Superman Movie Batman Vs Superman 2016. Thank you and good luck. Ipl 2016 Live Streaming. Cheers. We are happy you just read this specific. This can be a form of guide book which needs to be granted but not your hit-or-miss untruths that is certainly with the various other websites. Currently click this check cashing Take pleasure in your current expressing this specific ideal putting up.